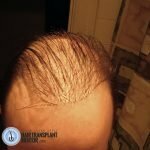 Living With A Hair Transplant - 25,000 Hairs And 25 Years Later! This is a pretty telling picture. Lots of real estate with some tree trunks that need to be rooted up. simply because I've had so much hair transplanted since my experience first started nearly 25 years ago. What this should show you however is that even with 25,000 hairs transplanted in a very conservative manner (mature hairline) that there are still areas of weakness that I have to deal with. This usually requires copious amounts of hairspray to keep my hair from moving too much in the wind and of course keeping a hairstyle that takes full advantage of the sweet spot for length that I've discussed in the past. 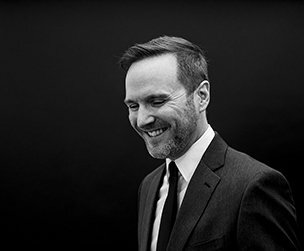 Had I been more aggressive with my approach and pushed Dr. Wong to give me a lower hairline then my hair would be thinner than it already is and living with a hair transplant would not be very fun. I like my hairline, I like the height, and I like the density (55 per cm2). If my hairline were even half of a centimeter lower than it is, and at the same density, I would have at least used another one thousand grafts that were instead placed elsewhere, such as my crown or my temple point, so those areas would be thinner now. Living with a hair transplant has been a really positive experience but that wasn't always the case, as I have shown in my hair transplant gallery but since I started taking smart steps and making the right moves my life has turned around and living with a hair transplant has been a joy. It is only because I took my time with my later procedures, didn't have massive super megasessions and didn't get too greedy. 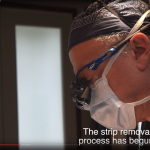 Slow and steady is the best way to live with a hair transplant and to consider each subsequent hair transplant (they always come eventually) with caution and a lot of thought. If you don't, then living with a hair transplant will most likely be living with a nightmare. In the past when I've met some patients I've actually had them say to me that if my result is what they can expect then they don't want to get a hair transplant. This makes me REALLY happy to hear because it means that their expectations were way to high and that they've just been spared a life of misery. Why? Because my result represents just about the best that a hair transplant result can be on someone with advanced hair loss so if my own result is a let down to some people because of it's shortcomings then they absolutely should not have a hair transplant. This ties in with Hair Transplant Class #001. In that class, I tell people that if they can't accept the fact that their hair transplant may fail or if they haven't thought of what they would do if they have a bad result then they shouldn't have a hair transplant. 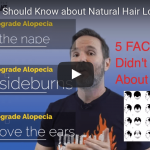 In this video, if one can accept a thinning appearance and understand the compromises that less than a full head of hair requires, then maybe they can handle the process and accept the final result. 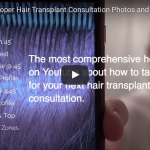 From here on out my hair transplant classes will assume that the worst has been considered and the desire for hair transplant surgery remains. I'll always discourage people from getting hair transplant surgery and I'll always push patients to accept themselves as they are but the further you get though the classes and maintain your desire for surgery then you'll be a better and better candidate for the procedure and the eventual results.